Timeline Music Annotation Library (TMAL) is music pedagogy that appends text (script and graphics) and/or audio commentary directly to the sound timeline of the music. This pedagogy was developed within the “Integrated Music Education” R&D project of Sonic Asia Music Consultants in Singapore. TMAL is a client-to-server systems-integration based on an Indiana University developed open source software (Variations Audio Timeliner 2&3). However, there are many sub-routines that make the server application quite complex and so it is quite impossible for the average musician to manage it without getting into contusion as your collection grows. Variations 2 can be used at the computer (laptop) level while Variations 3 is for applications on the server. Sonic Asia has not altered the software because it does serve TMAL requirements for this stage of application that relates to individuals and individual institutions. What is new is the client-server structure which has been simplified from the original literature as well as some of the original metadata prescriptions for the digital music library project at Indiana University. Sonic Asia had to do this because the experiences of all applying Variations 3 seems to fall of the cliff using the present notes. Current evidence shows that the original literature to implement Variations Audio Timeliner as a digital music library has not succeeded in having all the features of this software operational at the server level or within the library metadata system. My dealings with two universities in Asia that are implementing the Indiana version show they have had difficulties of different sorts. Both have not completed their projects as of the writing of this blog. The Sonic Asia server engineer and myself have been following up with the listsevr discussions and there too, there is evidence that many others, who are in different stages of implementation, are also showing signs of difficulty. Sonic Asia has also been in touch, a number of times, with the IT staff at Indiana. What we usually get is a one-liner - "you are free to develop this software as you see fit…." So we have! Indiana University library systems are based on Library of Congress FRBR architecture. This is good for academic communities that are text based and can refer to collateral (audio, other text, graphics, media, blogs, and other databases) from such text Music despite being exclusively audio based, has followed this same principle of having text as the main purveyor of thought without direct reference to the sound at the point of reading. Somehow, it was never deemed important to address the actual timeline of the sound that musicians (educators, academics, technologists, musicologists, collectors and more) have to deal with. There is no immediate solution to the current way things are done. However, TMAL will try to provide those who want to address text and graphics and other collateral directly to the music timeline and work with them to organise their material into individualised libraries. Sonic Asia has now structured a dedicated system of servers for audio digitisation, simple upload and laptop (personal computer) to server management to facilitate independent and individualised capability for developing personalised timeline music annotated repository using graphics and text (any language) via the Variations software. There are a set of servers that look after different routines - to store, retrieve and manage resources. These include links for collateral related to such recordings (text, graphics, audio visuals, animation, blogs etc.) and the ability of individualised clients to do grouping for shared work via a server administrator. TMAL can also be customised to link to pedagogy tools (specialised teaching platforms), collaborative tools (audio/video conferencing, shared screens, etc. ), and general teaching platforms belonging to institutions where TMAL is used. The Thau Yong Amateur Musical Association (TYAMA) was established in 1931 and is one of the oldest organizations in Singapore promoting Waijiang – known collectively through a more modern term as “Teochew Music and Opera” in Singapore. However, these are two distinct entities. Waijiang Opera (外江戏) refers to the collective whole of the music, drama, vocal arts and theatrics of the entire operatic art form in its traditional and pristine form. Also, the music that is part of the opera sequences that do not accompany the vocal arts, is also classified as a separate branch of the Waijiang arts and is called Waijiang Yue (外江乐). The latter can be performed on its own. This has made the entire arts of Waijiang rather dynamic and evolutionary. The art form was (and still is) ambulatory because it moved from its source in China to Asia and much of the music always went through adaptations and improvisations through time. From the early 1800s (era of the Qing Dynasty) Waijiang Yue spread to China’s Eastern Guangdong region and gradually gained popularity with the Teochew dialect population of that region. Other communities there like the Hakkas also adopted the Waijiang arts forms. The Teochews & Hakkas were one of the largest migrant groups into Asian countries like Singapore, Malaysia, Thailand and Indonesia. The Teochews and the Hakkas began to establish the Waijiang arts in Singapore from the 19th century up to the 1950s. Waijiang opera was a popular musical pastime for upper to middle class in Singapore. Unfortunately, from the 1960s, this art form declined because another form called Teochew Opera (潮剧) was popularized through movies and radio programmes. There was a global decline in traditional Waijiang music and opera. TYAMA, as a performing ensemble, is also currently Singapore's only complete traditional Waijiang music ensemble. TYAMA also does Teochew Opera. The association’s specific mission is to sustain the beauty and intricacies of music and opera from Chaoshan in China where the early Teochew migrants to Singapore came from. TYAMA began with eighteen Teochew immigrants who were steeped in Waijiang music and opera, and wanted to serve the artistic expression and needs of the Teochew community in Singapore, despite of their class. Before they began the association, they spent three years preparing and educating themselves, and then staging the first Waijiang opera at the Great World Amusement Park in Singapore. This performance made a marked impression on the community and also a niche for the Teochew community in the arts circle in Singapore. Since then TYAMA has presented more than 300 operas and music performances in Singapore – which included Waijiang opera, Waijiang yue, Teochew opera and Teochew yue. The word “study tracks” comes from the idea of tracks of music: as in CDs as well as in multi-track recordings. The fundamental idea developed after observing ethnomusicology field work in the Philippines between 1978-1981, where dual track field tape recorders were used for recording the music while informants and researchers jotted down on sheets of paper other relevant (and usually timeline related) musicological and cultural information. An observation was made that both processes could be done via the recorder by doing a mono recording of the music and the other track used for information gathering. Of course, there is need for many other systems configuration in between. This idea continued to develop in Singapore in courses that I taught at different institutions, particularly the Singapore Management University where a digital multi-track recorder was used for tutorial instruction around a table equipped AV capture technology. Students and experts could sit around this table and document verbal information and analysis on a single track of music with many other tracks of information. This technology can be as communicative as technology will allow - linked to conferencing system it enables researchers and students to obtain information from experts who may be far away. It is the accessibility of the expert and the ease of documentation in an assessable way that is at the root of this technology. 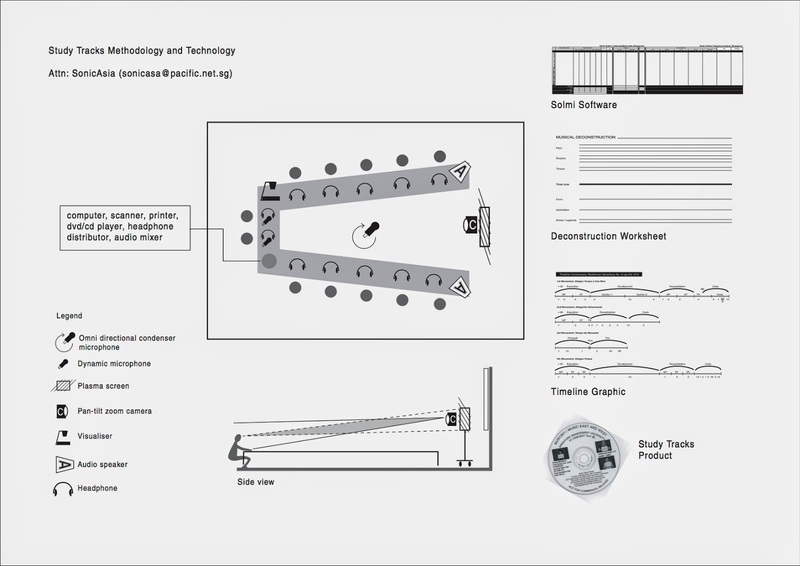 A documentation and library method developed for students in the East West Music course at the Singapore Management University (2000-2007) to create timeline music annotated products as final assignments. It came to be known as the Study Tracks Method. It also led to the building of a Music Laboratory. A separate blog article will be written on this soon. 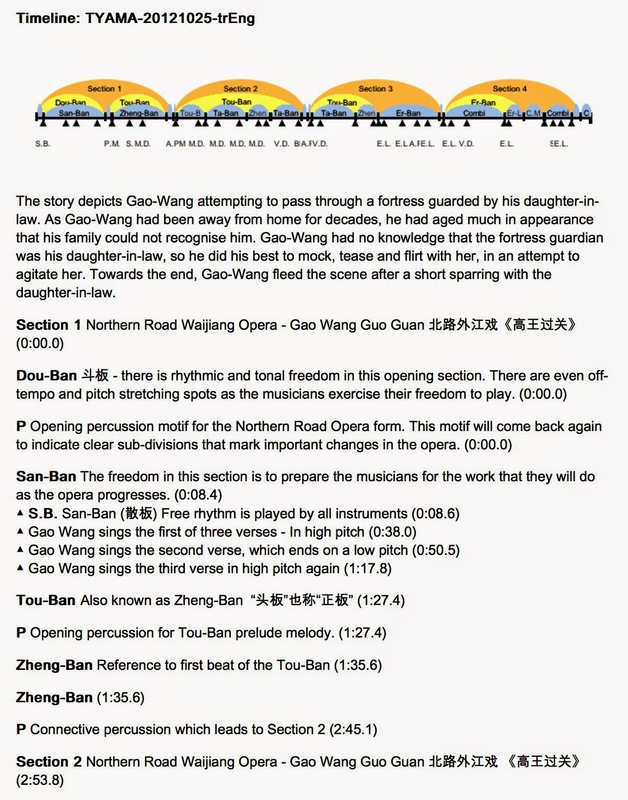 For the research and documentation of Waijiang, a similar method was used except now Variations played a central role in getting the thoughts of the expert Mr. Yeo How Jiang, understood by informants and translators and collated into multi-audio tracks before being assembled into a commentary script. In the recording above you can hear the music, the expert speaking in his native language an the informants taking with him and a translator speaking in English. This example is part of data collection and will be in the Tayama Audiorama. Yeo How Jiang (1929 - ) is based in Singapore, and is believed to be the last surviving master of the Chinese pre-revolution Waijiang Music in Asia. Exposed to Waijiang and Teochew music daily from a tender age of 8, How Jiang learnt all the percussion, instruments & singing techniques associated to Waijiang Opera in his youth & also become one of the pioneers of Chinese Orchestral (Huayue) music in Singapore by the age of 40. Due to the political influence of China’s liberation to all performing arts in & outside of China, Waijiang Music & Opera lost the supply of instructors by 1960s & with the death of existing instructors and other capable artistes in Singapore, currently How Jiang, 84, has become the de facto last master of Waijiang Music in Singapore, Malaysia, Indonesia & possibly Taiwan & China. To date, he has played instruments, percussion & acted in Huayue, Waijiang & Teochew Opera & music for over 300 performances. Mr. Yeo is also capable of re-creating much of the old music that was recorded in 78rmps (shellacs) that the association possess using the same Study Tracks Table and recording track by track with the different instruments over the music of these old recordings using the old studio "sound on sound" technique. Variations Audio Timeliner can also provide a text print of all that was documented. This text is a complete document containing all the text in all the languages used in the Variations analysis, but with the added codes for locating the timeline as well. It depends how this text is used as it is still early days for developing readable products. However, if one is looking at digital books as an ancillary to Variations then this text format may become very important in making the timeline connections. Currently, Variations is being used for coursework and database development. For teaching and learning, computer clusters are put into sub-nets so some of the Variations systemic functions can be simulated. Students can also work at the laptop or desktop level, and they are trained how to transfer work between computers and also within the filing systems of their own computers. There are strict rules for this as Variations is essentially sever-based, and has as priority, the protection from piracy of the music it holds. From August 2014 part of the full system will be open for testing with some users - research groups like TYAMA, music collectors, composers, musicologists and for services like simple analysis of music for concert attendees. Most importantly, Variations-3 is seen by Sonic Asia as a vital technology for music education pedagogy. Music education is the custodian for truing the largest part of the music chain. Sonic Asia believes that timeline music annotation will be the direct way to provide information to young people and allow them to grow by expand the information through web mining and linkages. A seismic change in music education method is necessary. And it does not need to be by the system. Individual teachers can change and develop their TMAL for their specific areas of expertise or interest. The large cohort of young people in the music education programmes of Asia are avid listeners to the very genres of music that is threatening the sustainability of the traditional and indigenous musical systems in their vicinity. By peer pressure and global youth culture these young listeners are developing their own clairaudience-based skills that include socio-cultural knowledge of the music and musicians and the technologies and techniques involved in their preferred genres. A pedagogy based on delivering information to any work of music on its sound timeline would stand a better chance of taping in on the huge propensity they have for self-developed music cognitive development. With professional assistance timeline music annotation could be used to develop listening skills across musical systems in these young people that would help bring equability between the Western and other musical systems and cultures in all defined territories in Asia. How do you get an account for TMAL?